If you asked me my number one concern for Chadron High School, I would easily know that answer .... Attendance! Overall, our student body does a very good job of attending school regularly. But it is just too obvious that attendance directly affects grades. With our 90 minute blocks of class time, this is especially true. This morning I ran some reports to show the correlation with days missed and grades. Take a look at our current enrollment of 260 students. There are a variety of reason why students miss school, but for our state reports all absences fall into two categories: Excused and Unexcused. All other absences are unexcused, this includes any pre-arranged absences due to family trips. It is important to note that according to Nebraska Law (79-201), Chadron High School students can not have more than 10 unexcused absences per semester. Any student with more than 10 unexcused absences in a semester are reported to the County Attorney. I've always viewed this policy in a similar way to many of us adults at our workplaces. We get 10 days of personal leave (for an entire year though) that we can use without disciplinary actions from our employer. However, in a school environment these absences often directly affect the student's grades as noted above. All efforts should be made by absent students to use 'Access Time' for one-on-one help from their teacher as needed to stay current on assignments. Access Time happens twice a day: 7:30-7:50, and 3:15-3:40. So, my advice for any student that wishes to succeed in school .... attend regularly! Yesterday I grabbed my iPad and spent 30 minutes walking through the building in and out of classrooms. I thought I'd share some insight of what it looks like inside the walls of Chadron High School. iPads For Every High School Student??? The rumors are true, yes, we will be providing every student with a school-issue iPad! We hope to have the iPads in our student's hands sometime around Thanksgiving Break. We've been working on a 1:1 iPad initiative for over a year. After a lot of discussions and planning we have found a way to fund this venture through our current technology budget and some cost savings on textbook purchases, copier toner, and paper to name a few. Teachers have already been preparing digital curriculums the past couple of years since we introduced overhead projectors in every classroom along with more emphasis this fall. This August, we issued school email accounts for every student and the encouraged use of working on 'the cloud' to submit papers and homework in a more paperless setting. We still have a lot of training planned for staff, students, and parents before we are ready to distribute the iPads when they arrive. Teaching with technology is both a district and state goal for education. Our expectations are to slowly explore content uses for students this semester and then be ready to incorporate the iPads more fully next semester. I would like to emphasize that iPads are simply a tool used to deliver and communicate our curriculum, our goal is to teach content standards. The iPad is simply a more interactive tool to accomplish this goal. It doesn't take long to research the many benefits of blending technology (or specifically iPads) into the classrooms. We looked at a variety of tools for use including laptops and other tablet devices, we chose the iPad product due to lower cost and the more educational applications available that Apple has been releasing. I'll provide more details for students at our assembly this afternoon. Parents and students will be asked to attend a training before the deployment of these devices at a date to be determined. Thank you all for your support in our pursuit to accomplish this endeavor! Last spring we proved we are leading the state with the outstanding results on our state tests. It was confirmed even more yesterday when the Governor called to announce his arrival on October 30th to visit with our district staff and administrators to commend us for our successes and ask our opinions on where the state could focus their efforts to improve student performance. Arriving with Governor Heineman will be the Nebraska Education Commissioner Dr. Roger Breed and State Senator Greg Adams. These are the three biggest influences on education in the state. We are excited to hear that they are willing to come recognize us for our efforts and achievements. We are honored to be recognized and called upon to model and provide insight for the leaders in our state. What's next for Chadron High School? ... Continual Improvement. Our staff is fearless in finding how to improve what we do. We are blessed to have the staff and students that are willing to put our school on the front lines of educational change. So .... stay tuned! Students in Mrs. Drinkwalter’s Advanced Algebra II class ran an experiment to test the elasticity of a rubber band. They used a paper cup and glass gems to put stress on the bands. They took measurements with a ruler. Their tools were primitive, but after taking 20 + measurements a mathematical trend did materialize. They used technology to calculate a regression line to model their results and then used computer software to print a graph as well. As a parent, you've probably noticed or heard your student refer to signing up for Remind101. Maybe you're wondering what Remind101 is all about, here's some information regarding this free tool used for communicating via text or email messages. 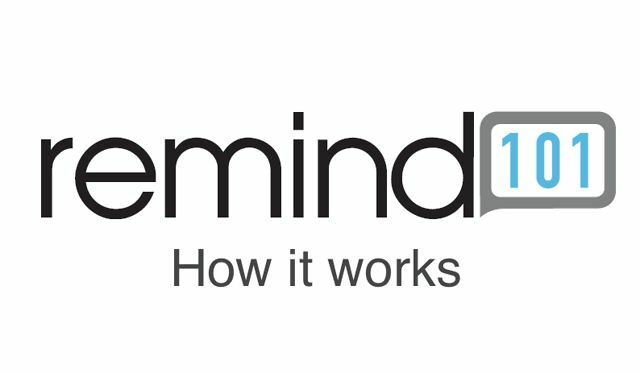 What is Remind101?Remind101 is a free website designed for teachers that provides a safe way for teachers to text message or email students and parents. Even thought it is originally designed for teachers, anyone can use the service. Will students see the teacher's (or other student's) cell phone number? No, that’s the beauty of remind101. Each teacher is assigned a phone number, which a student or parent will text to subscribe. Once subscribed, remind101 will ask for the students/parents name so that the teacher can identify them. remind101 never shows the teacher that person's number, which means they never see student numbers and students never see theirs. How do students or parents sign up? Students and parents sign up for notifications by sending a text message with a teacher's class code. They may alos sign up by sending an email to the teacher's code. Who is using it at Chadron High School? Last year, I used remind101 to notify staff of school notices (ex. school closings, or schedule changes). This year I've expanded it for all student and parents connected with our high school to share these notices (For instance: I used this service last week to notify students and parents that we had no school Thursday or Friday due to the wildfires). In addition, most teachers and coaches are using it with their students involved in their respective classrooms and activities. First, a teacher adds his/her class, which generates a unique code. The teacher then shares that code with students or parents. At that point, any student or parent who sends a text message with the code will be "subscribed" to the teacher's class. Any time a teacher sends a message from remind101, all the students or parents subscribed will receive it. Feel free to sign up for Chadron High School school notices for the this school year by sending a text to the number: (412)203-8843 with the message "@chsnote"
Well, we've survived the fires ... thanks to the hard work of firefighters! This includes the many federal agencies, our local Volunteer Fire Department, as well as many area ranchers out lending a hand to protect property. It was quite the community and regional effort! We are blessed to live in the surroundings of so many caring people. Back to school .... We are continuing to focus on our school goals of reading and writing skills for all students. At Chadron High School, every teacher is a reading and writing teacher. Every class, every semester is required to include a reading activity with selected academic vocabulary terms related to the classroom subject with students completing short written summaries. These summary papers are graded and placed into the students' portfolio. When the student graduates, we give them their portfolio showing four years of improved writing skills. In addition, every week we have a school-wide 30 minute time for silent reading. Our amazing results on the recent state tests lead us to believe that the efforts we've placed on reading and writing is providing the foundation for our students to succeed on standardized tests. Success on tests of math, science, social studies, or any other subject relies on reading and comprehension of the material and questions. Therefore, we'll continue to invest our time on our school goals of reading and writing for all students.